Lambert Hitchcock struck gold with the Hitchcock Chair Company in the 1820s by capitalizing on a then-novel idea—mass production. Inspired by the clockmakers of his era, Hitchcock believed the concept of interchangeable parts could be adapted to the chair industry, an insight that came to him as he apprenticed under Silas Cheney of Litchfield. 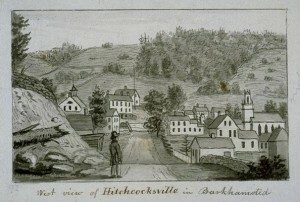 On completing his studies in 1818, Hitchcock moved to the township of Barkhamsted and opened a store at the Benham-Doolittle sawmill at the fork of the Farmington and Still Rivers. The “some assembly required” idea rapidly took off. Initially, Hitchcock focused on manufacturing chair parts, but as shipping orders came in from as far away as Charleston, South Carolina, he began producing entire chairs alongside cabinets, tables, and candle holders. 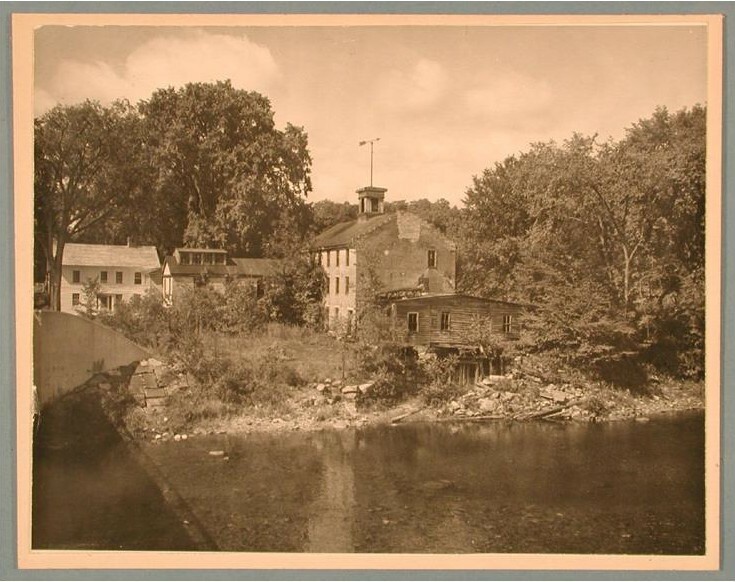 By 1821, Hitchcock’s small operation had become so well-known that the area around his mill was dubbed “Hitchcocksville.” This designation would continue until 1866, when the town changed its name to Riverton. Business continued to boom and in 1825 Hitchcock expanded, building a three-story brick factory that facilitated increased production and provided much-needed storage space for the growing stacks of assembled chairs. Over the years Hitchcock designs varied, but Lambert’s early chairs were known for their broad back panels, narrow slats, square drop seats, and very sturdy legs. Perhaps their most distinguishing feature, however, was the hand-painted stenciling, which included the famous emblem: “L. Hitchcock. Hitchcocks-ville. Conn. Warranted,” which adorned the back of every Hitchcock chair. By 1826, Hitchcock’s company had grown to about 100 workers, including many women, who were responsible for painting the intricately etched patterns on the furniture. The factory produced about 50 chairs daily and used a variety of woods including maple, beech, and birch. But as business grew, Hitchcock found himself in a bind. Transportation was slow during the 1820s and although chairs were selling well, it took so long to ship them and collect payments that the company fell further and further into debt. Hitchcock tried cutting costs by “farming out” manufacturing work to the state prison in Wethersfield, but it wasn’t enough. By 1829 the company was operating in debt with posted liabilities of more than $21,500 dollars and declared bankruptcy. The company operated under a trusteeship until 1832, when Hitchcock reorganized and partnered with Arba Alford of Simsbury, Connecticut. From 1834 to 1837, Lambert ran an additional chair shop on State Street in Hartford. Hitchcock & Co. was dissolved in 1837 in favor of Alford & Co., which continued the chair manufacturing business at Hitchcocksville and the Hartford store. Three years later, Alford & Co. disbanded and Alford invited both Hitchcock and craftsman Josiah Sage into a new partnership, “Hitchcocksville Co.,” which took command of the Hitchcocksville factory in 1841. This partnership continued until 1844, at which point Hitchcock removed himself and established his own cabinet shop in Unionville, which he ran until his death on April 3, 1852. The following year, Alford dropped the “Hitchcocksville” name in favor of “The Phoenix Company” and continued to manufacture chairs until February 1864. Alford sold Phoenix to Delos Stephens, a manufacturer of ivory-tipped pocket rules and joiner’s tools, effectively ending the chair business at Hitchcock’s old mill. Stephens operated the three-story factory in Riverton until 1901, and for the next 40-plus years, locals used the factory space intermittently for wood turning, ladder making, rubber production, and storage. In the spring of 1946, West Hartford shoe salesman John Kenney happened to be trout fishing on the Farmington River. He made his way into Riverton and stumbled on the old Hitchcock mill. 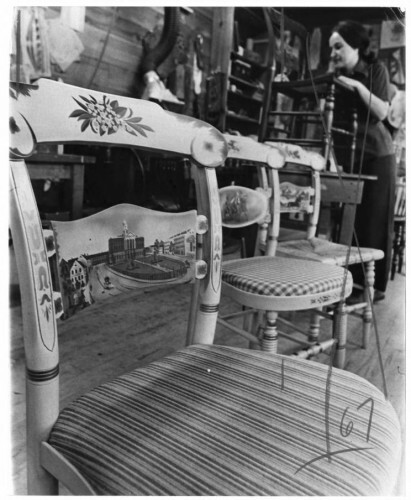 Apart from a Hitchcock chair he’d received as a wedding gift, Kenney knew nothing about the old mill’s history, but an obsession with the story of Lambert Hitchcock inspired him to try his own hand at the chair business. He partnered with Douglas Roberts, a descendent of the Alford family, bought the factory, renovated it and reopened Hitchcock Chairs in late 1946. The business plan was simple: manufacture period replicas of Hitchcock’s famous furniture. Attention to detail was paramount and Kenney ensured all chairs were stenciled with the signature emblem: “L. Hitchcock. Hitchcocks-ville. Conn. Warranted.” By 1955 business was booming and the reinvented Hitchcock chair was selling to stores across the country. The Riverton factory employed approximately 80 workers and thousands of visitors came to the showroom each summer. Part of the factory’s success, Kenney would later say, came from the fact that the reinvented Hitchcock brand represented the confluence of two uniquely New England symbols–superior craftsmanship and homemade charm. When he dropped what he called “the magic name” of Hitchcock, buyers were interested, and when they learned he was producing the chairs out of the same Riverton factory as Lambert, they were sold. During the fall of 1947 Kenney capitalized on his branded name and attracted many buyers across New England. His sales pitch worked equally well as far away as St. Louis, Chicago, and Detroit: it seemed everyone wanted a piece of affordable, colonial-style New England charm. By 1950, journalists began to take notice. Life magazine gave Hitchcock Chairs a three-page spread in May of that year and touted the factory’s superior craftsmanship and homey location as emblematic of the rebirth of a lost era in furniture making. It was the perfect echo of Kenney’s 1947 marketing pitch; investors flocked to the company and orders skyrocketed. Then, in August 1955 Hurricanes Connie and Diane hammered Connecticut within weeks of each another and Riverton was among the many flooded areas. Though the factory reported $100,000 in damage and lost turnings and machines, disaster assistance helped the company get back on its feet. By October 1955, Hitchcock had returned to 90% of its pre-flood production. By 1967 Hitchcock had nearly 190 factory workers and made approximately 80,000 pieces of furniture per year. Two years later, Kenney handed the presidency of the factory to his son-in-law, Thomas H. Glennon. 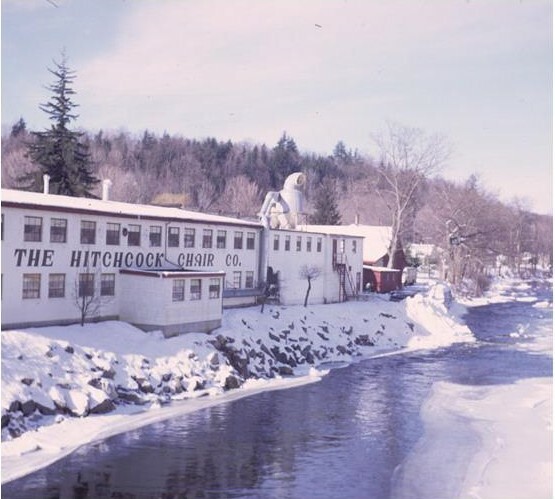 Hitchcock continued to grow under Glennon’s direction, and in 1976, the company broke ground for a new $2 million factory located in New Hartford. This 112,000-square-foot facility boasted modern manufacturing tools and much-needed storage space. The Riverton factory continued operations as an expanded store with dedicated factory space for rush-order stenciling, painting, and weaving. Yearly sales hovered around $15 million and Glennon boasted to the Hartford Courant that the factory hadn’t had a single layoff since its reopening 30 years earlier. But layoffs were not far off. Rising fuel prices and foreign competition began to put the squeeze on Hitchcock and in 1979 the factory adopted a 4-day work week, nominally to reduce energy costs. Glennon tried to triage the company’s hemorrhaging balance books by carrying outside furniture brands at Hitchcock retail stores and eliminating all “cash-and-carry” orders, but it wasn’t enough. In the summer of 1990, the company’s manufacturing assets were sold to Kenrobin Industries. Six years later, Ronald Coleman bought the company. In 2005 he put Hitchcock up for sale, saying the company’s custom-made furniture couldn’t compete with cheaper, mass-produced products crafted overseas. No buyers stepped forward. Coleman closed Hitchcock in May 2006, shuttering all company stores as well as the New Hartford and Riverton factories. The company’s remaining 55 employees received pink slips. Once again, the Hitchcock brand proved resilient. In spring of 2010, a seller of restored Hitchcock furniture, Rick Swenson, and business partner Gary Hath acquired the rights and designs—and Riverton is once again home to a Hitchcock factory store. Patrick Skahill is a journalist based in Hartford. Kenney, John Tarrant. The Hitchcock Chair; the Story of a Connecticut Yankee--L. Hitchcock of Hitchcocks-Ville--and an Account of the Restoration of His 19th-Century Manufactory. New York, NY: C.N. Potter, 1971.